and to evolve some of my PokemonI don't have much to offer but the starters are not that rare. Last edited by MemorableC on Sat Apr 24, 2010 9:30 am, edited 1 time in total. I am willing to trade more than one of what I'm offering for the few that I want and can also attach berries, tms, master balls, etc. I can also trade pokemon that I may not have listed, just ask. And yes, the Deoxys are legit -__- thankyouverymuch. Looking for a female Spirtomb and a Manaphy quickly so I can breed it and put it in the dex, but spirtomb to keep. I can offer many pokemon that aren't legends. Have both (and an extra Manaphy you can keep). Want: Event Pokemon, "oustanding" pokemon, shinies, etc. I don't need those two anymore, already got them a few hours ago. I Cleaned up this post on page 16 so feel free to look at that one instead. Last edited by MAXC00L on Thu May 20, 2010 3:18 pm, edited 18 times in total. I'm currently breeding relatively superior Eevees. All of my Eevees up for trade have at least 2 max IV stats and are "relatively superior" according to the BF Judge (meaning they have good IVs overall). I also have relatively superior Totodiles w/ Ancient Power and at least 1 max IV, relatively superoir Clamperls, and all starters up for trade. I am looking for events, shinies, ANY "outstanding" pokemon, etc. However, I will settle for any starter (preferably grass starters) for my trade box, or a good hold item (anything really). Please PM me, I'm sure we can make a deal. I just want to free up box space! I have a Shiny Snorunt and a Shiny Riolu. First Come First serve. I will accept 5 nuggets or a UT Legendary/event(depends) for each. Last edited by MallratDogma on Sun May 02, 2010 4:40 pm, edited 1 time in total. I have some UT Fly-chus and Surf-chus. I'm looking for a glaceon, leafeon, rotom, and any starter pokemon besides cyndaquil for my soulsilver game. I have plenty of pokemon I'm willing to trade. I'm not really sure what anyone will want. I can breed my typhlosion if anyone wants cyndaquil. I have a fair amount of pokemon. You can ask. If I don't have it, maybe I can catch it quickly or something. Thank you everyone! I am getting ready to face Red, so I want to get a new team together. and almost any other legend! I will give out my trainer name and friend code when i recieve a reply pm with yours. Last edited by cobra123 on Wed May 12, 2010 6:44 pm, edited 1 time in total. I have 5 or 6 lucky eggs i would trade for various shinies.. I am looking for an eevee, because i'm too impatient to finish the national dex on Diamond. I'm looking for the VGC10 S.Eevee, Because I wasn't able to drive up to Washington or down to Cali. Preferably UT. I don't care if it's cloned. I can offer another UT Level 1 shiny or a shiny Eevee with Wish as an eggmove. I am looking for a Timid Nature Latias, preferably with decent to good hp, def, special def, and speed ivs. The ivs arent required though. Please no hacked pokemon, I want to be able to enter tournaments with my team. Best Offer: Timid Mewtwo fresh caught at 70. 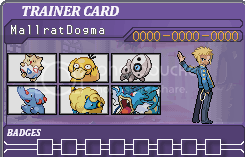 (Perfect for the UBER metagame). Above Average IVs and a fantastic Speed IV being its best (According to battle tower guy). Nearly every starter except Sceptile, Chimchar, and Squirtle. I can also offer the starter with their respective hyperbeam move. Three legendary dogs at lvl 100, not Ev trained but does have random ev spreads. Calm Uxie fresh caught at 50. If your looking for something else in particular I may have it, so just ask. Last edited by darkn00b on Mon Jun 14, 2010 8:48 pm, edited 1 time in total. Offering: Please note I will only trade Event Pokemon for Event Pokemon. All Pokemon must be Legit, i will not trade if its not Legit. Last edited by AlphaArceus on Tue May 25, 2010 1:34 pm, edited 2 times in total.